Heat the oil in a wok over high heat. Add the onions and stir-fry for 2-3 minutes or until softened slightly. Add the ginger and curry paste and stir-fry for 1 minute or until aromatic. Add the coconut milk, stock and kaffir lime leaves and bring to a simmer. 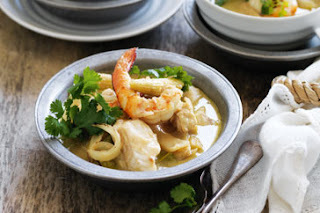 Add the fish, prawns, baby corn and bamboo shoots and cook for 2-3 minutes or until fish and prawns are just cooked through. Remove from heat. Add the lime juice, fish sauce and sugar and gently stir to combine. Spoon among serving bowls. Top with coriander leaves. Serve immediately with steamed rice, if desired.